The upcoming Marvel mega-sequel, Avengers: Age of Ultron has released a new character poster focusing on Jeremy Renner as the team’s ace archer, Clint Barton, aka, Hawkeye. While it may not be chock-full of impactful elements or revealing, newsworthy credit blocks like the poster Marvel dropped last week, it is a somewhat cool shot of the Avenger. However, while it looks like the film will have Hawkeye bringing a bow and arrow to a robot fight, it’s clear that the purple-clad combatant against evil will have a lot of screen time to make up for after the way he got whammied by Loki in 2012’s The Avengers. There’s not much to say about this poster as far as any potential revelations about the film’s plot or about Hawkeye, himself. It’s just Jeremy Renner’s badass, but underutilized Hawkeye standing in the hypothetical battlefield of "posterland," looking stoic, readying his bow and lost in deep thought, while, possibly unbeknownst to him, one of many Ultron bots lurks leaping in the background, ready to pounce on our hero from behind. As anyone who saw 2012’s The Avengers is aware, Hawkeye kind of got the short end of the arrow when it came to the team-up movie debut. In his hyped cameo appearance in 2011’s Thor, fans were elated to finally see the Avenger archer, planting what felt like a critical seed for the ensuing cinematic event the following year. 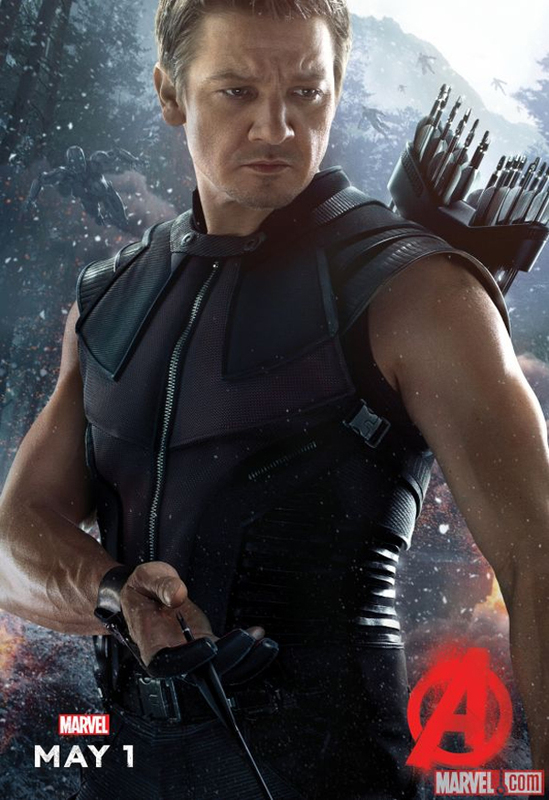 However, while The Avengers left very few disappointed as far as pure action, pacing, and humor were concerned, the fact remained that any hope of prominence for Hawkeye in the film went up in a magical spark early on when he was possessed into temporarily spending the majority of the film as Loki’s lackey. While the mind control trope paid off slightly with some antagonistic Avenger-on-Avenger action against his former flame, Black Widow, for the most part, it rendered the character innocuous, leaving him only to pick up the pieces against the Chitauri alien invasion in the last act. This certainly did not go unnoticed by Renner, who was reportedly disappointed with how he was used in the film; fueling rumors that he would not even renew his contract with Marvel. However, those issues were either exaggerated or have been resolved. While he’s been relegated to the the Marvel sidelines for 3 years, Renner does still seem to be enthusiastic about his character and has even expressed a desire to branch him off into a possible solo film. Apparently, things have worked out for the best as Hawkeye will, indeed, return for another go with The Avengers in Age of Ultron, giving the character plenty of opportunity to make up for a lot of lost time. (Despite being put in this uninspiring poster.) This time, we’ll likely see him engage more in the dynamic team chemistry which played a part making the characters stand out amidst the carnage of CGI that was the previous Avengers film. Avengers: Age of Ultron will have Hawkeye back in peak form, unfettered by magical roofies when it hits theaters on May 1.